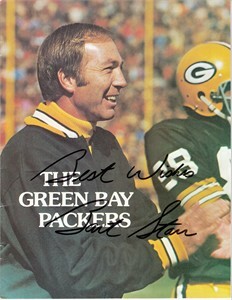 Green Bay Packers 1979 recruiting magazine sent to prospective players autographed boldly in black Sharpie by legendary Hall of Fame quarterback Bart Starr and inscribed Best Wishes. With certificate of authenticity from AutographsForSale.com. ONLY ONE AVAILABLE FOR SALE.